I'm telling you, we're really screwed. I think we would be much better off just to let this thing play out. Yes, it will hurt, but these people trying to fix things don't really have a clue and anything they do will merely postpone the inevitable. Alternatively, they have created the crisis from which they are trying to "save us" in order to transfer more power and wealth from the people to the elites. I think we should choose a very large number of government officials, senators, and congressman (and women) and run them out of town on a rail. What are so many people doing walking around in a typhoon? It looks like they're out shopping. Only some of them? Dead pirates are good pirates. There's a little more info here. 48 B.C. - Pompey the Great was murdered on the orders of King Ptolemy of Egypt. It turns out he wasn't so great after all. 1787 - The U.S. Congress voted to send the new Constitution of the United States to the state legislatures for their approval. McCain voted "Yea," Obama, "Present." 1850 - The U.S. Navy abolished flogging as a form of punishment. Darn, no flogging for you! 1955 - The World Series was televised in color for the first time. The game was between the New York Yankees and the Brooklyn Dodgers. Of course, nobody actually had a color television set then. OK, one guy did, but he was watching a DVD. 1961 - "Hazel" premiered on NBC-TV. 2000 - The U.S. Federal Drug Administration approved the use of RU-486 in the United States. The pill is used to induce an abortion. Aren't you glad Mom didn't use that pill? See what I mean, that's not really music history so much, maybe a little. It's pushing it. The effort appeared to be part of a move by the Obama campaign to block advertisements to which it objects. The campaign also sent "threatening" letters to several news agencies in Pennsylvania and Ohio demanding they stop airing ads exposing Obama's gun stance, according to the National Rifle Association. "This abuse of the law for intimidation insults the most sacred principles and ideals of Jefferson," said Blunt. "I can think of nothing more offensive to Jefferson's thinking than using the power of the state to deprive Americans of their civil rights. The only conceivable purpose of Messrs. McCulloch, Obama and the others is to frighten people away from expressing themselves, to chill free and open debate, to suppress support and donations to conservative organizations targeted by this anti-civil rights, to strangle criticism of Mr. Obama, to suppress ads about his support of higher taxes, and to choke out criticism on television, radio, the Internet, blogs, e-mail and daily conversation about the election." Blunt concluded: "Barack Obama needs to grow up. Leftist blogs and others in the press constantly say false things about me and my family. Usually, we ignore false and scurrilous accusations because the purveyors have no credibility. When necessary, we refute them. Enlisting Missouri law enforcement to intimidate people and kill free debate is reminiscent of the Sedition Acts – not a free society." Here's what I took away: The really, really rich movers and shakers are completely convinced that neither Sen. Obama nor Sen. McCain have a clue about the economy, or how to fix the plague of fiscal problems descending on America. The advisers with whom they are surrounded are shallow and have very little to add to the discussion. I can't say I really disagree with this notion. What I do know is that good old economic conservative principles that have always worked in the past will work now, if given the chance. Free markets. Less regulation. Consistent oversight. Growth. As for ordinary folks, don't buy more mortgage than you can afford, and live below your means. Do you really think the government that helped create this mess through over-regulation can make it better by adding more regulation? I want our congressmen and senators to get their grubby, fat fingers out of the pie, to hell with their power trips. They are already trying to add credit card debt, automakers, and ACORN into the deal. Either they don't have a clue what they are doing, or they do know what they are doing, and either way we, the people, are the ones who are getting royally screwed. It is ironic that in this election cycle, which has featured more subterfuge, wild propaganda and more evidence of our nation's overall disintegration that any other, unforeseen circumstances have suddenly created a scenario in which façades are being peeled away, with those who maintained them having no say in the matter. We are indeed at war – corruption within our industry and government has brought our economy to near-devastation, and we are faced with a choice between two fundamentally corrupted parties. Though one is mistrusted, the other proposes solutions that all but the most ignorant know will be tantamount to pouring a volatile cocktail of accelerants onto our nation's smoldering woes. The alarming aspect is that for many, the choice is still a difficult one. So SpongeBob Squarepants is Scientifically Correct? There are lakes on the ocean floor. Still no sign of fire or squirrels, though. It's interesting. I'm glad we've done it. We do learn a lot from it and it has been invaluable to our understanding of our universe, but I don't agree that it is the key to mankind's survival. Surely God will not hear vanity, neither will the Almighty look on it. Harry Reid, Nancy Pelosi, Barney Frank, Christopher Dodd - among others; your economic future are in their hands. Don't you feel safer already? Americans have lost control of their own destiny. Elections don't mean much. Congressional debates are illusory. We are on a path to tyranny. Neither Barack Obama nor John McCain is going to stop it. Neither a Republican Congress nor a Democratic Congress is likely to slow it down. That such a reckless political stand could have been taken by the Democrats was obscene even then. Wallison wrote at the time: "It is a classic case of socializing the risk while privatizing the profit. The Democrats and the few Republicans who oppose portfolio limitations could not possibly do so if their constituents understood what they were doing." Will there be far-reaching consequences without some intervention? Probably, but we honestly don’t know since we've really never seen this level of greed and stupidity all rolled into one massive move. But may I suggest that letting "Uncle Sugar" step in and bail out the billionaires who made the mess will be far worse and will start a long line of companies and individuals who will demand the same of the government---which last time I checked means that they will be demanding it out of YOU and ME. This is not money that Congress is risking from THEIR pockets or future, but ours. Many if not most of us have already experienced lost value on our homes, retirement accounts, and pensions. Now they’d like for us to assume some further risks so they won’t have to. What happened to the "free market" idea? Is that only our view when we WIN and when we LOSE, we ask the government to come in and take away the pain? Rep. Alcee Hastings told an audience of Jewish Democrats Wednesday that they should be wary of Republican VP nominee Sarah Palin because "anybody toting guns and stripping moose don't care too much about what they do with Jews and blacks." How 'bout if you tote guns but don't strip moose? What if you have a gun but don't tote it, and you strip moose? Why is the moose wearing clothes anyway? I missed that point. ...everything you see other people doing is framed in terms of race. ...the only reason you can imagine Obama would lose is because of racism. U.N. inspectors have been ordered to leave, and U.S. officials and IAEA representatives confirm that reprocessing at the facility could begin in just a week. If banging your head against the wall is making your headache worse, why keep doing it? Here's a fresh idea, let's give North Korea lots of money and gifts if they will only promise to dismantle their nuclear program. The bursting of the housing bubble -- which in turn precipitated the collapse of the financial and credit house of cards -- is entirely government-made. Point fingers where you will, but I point mine at those congressmen and administrations that sought to win popular support by turning the Federal Reserve System, Fannie Mae, and Freddie Mac into public reservoirs of easy credit and home loans, available even to the riskiest and most credit-unworthy of borrowers. For years, the federales have artificially lowered interest rates and opened the loan spigots for institutional borrowers which -- under inducements and even statutory pressures -- opened their credit spigots, in turn, for just about any and every would-be homeowner. The usual tests of credit-worthiness that typically govern lending practices in a free, competitive marketplace were recklessly abandoned -- sometimes under "moral" claim that rigorously screening prospective borrowers is "discriminatory." So, lending has become increasingly indiscriminate, especially in the sub-prime, adjustable-rate-mortgage market. I remember when the government was cracking down on "discriminatory" lending practices. This is a must-read article, he dots all the I's and crosses all the T's. If you were old enough, you remember how this went. This is an interesting talk given by Richard Dawkins, a staunch athiest. Whereas he sees evolution when looking at the universe, I see God's hand in the creation. He gives an example of a man questioning his friend about the sun and the Earth. "Tell me", he asked a friend, "Why do people always say it was natural for man to assume that the sun went around the Earth, rather than that the Earth was rotating?" His friend replied, "Well, obviously because it just looks as though the sun was going around the Earth." To which he replied, "Well, what would it have looked like if it had looked as though the Earth was rotating?" And so I ask the question in regards to the universe. If you cannot see the hand of God in the universe in which we live, if you see a self-created, evolving universe, what do you suppose a God created universe would look like? If you are going to think beyond self-imposed or evolution imposed barriers, why not truly do so? Why not consider all possibilities? If we have evolved to live in this "middle world," instead, why could we not have been created to live here, perfectly suited to our environment? A rock is solid to us because it needs to be solid to us. Perhaps we have God imposed barriers for a reason that suits God's purpose for us. That is probably not something you are going to find by studying the universe. Looking at the world around us - alone, however far into the depths of what can be known - is not enough. If that is all you are doing then I can sympathize with you, I can see why you can come to the conclusion of an evolved universe. It takes more. It takes revealed knowledge, revealed from the very Creator Who put us here, and it takes a relationship with Him for that knowledge to be revealed to us, and it takes a mind open to the possibility to start that relationship. It takes time, and willingness to obey what you learn, but if you are open to the possibility, and with reverent fear - not paranoid fear - reverent fear and study of His Word, the Bible, you will find it a book of endless learning. It's pages open up to you like science reveals the hidden mysteries of the world around us, no matter how closely you look, it reveals a complexity and richness that mirrors that of the universe itself. Then you will begin to see your "middle world" in a whole new light, as just a temporary, stepping off point to a realm of possibilities that truly cannot be humanly imagined. But you will see glimpses and flashes of what is to come and the drumbeat will no longer hold you in its sway. God will not be found on your terms, but He will meet you where you are when you are ready. Never judge God on the basis of any human being or what they believe, don't shut that door because of preconceived notions gathered from the utterances or actions of other "middle worlders." You relationship with God will be personal or it will be non-existent. Just sayin'. Wish you were here. In truth, and in direct opposition to the drumbeat, each human being must be accorded his or her natural rights, individual sovereignty, and self responsibility to be in harmony with human nature. Each of us must have the freedom to succeed or to fail. Western culture, culminating in the great American experiment, has been perverted. Due to these perversions, many failures have already occurred, which have then, ironically, been used to justify further perversions of the same sort as those which caused the problems to begin with. This is an excellent piece. I highly recommend it, and it's exactly what I see going on around us. 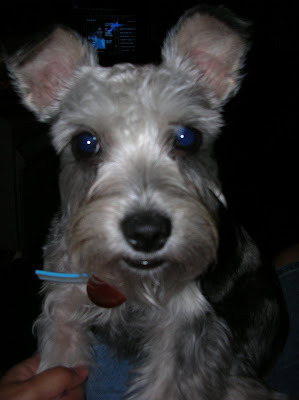 She's a Miniature Schnauzer. She's athletic, smart, and fun-loving, not to mention cute. She loves to chase turkeys and squirrels, but we don't give her the chance. Poor Mads. Nicholas Provenzo condemns Palin for the birth of her baby Trig, who has Down syndrome. Provenzo, who writes for the Center for the Advancement of Capitalism, not only bashes her for allowing Trig to be born, but says she should have made the so-called morally justifiable decision to kill him in an abortion. The Center for the Advancement of Capitalism bills itself as a group "dedicated to advancing individual rights and economic freedom through Ayn Rand's philosophy of Objectivism." "Like many, I am troubled by the implications of Alaska governor and Republican Vice Presidential candidate Sarah Palin's decision to knowingly give birth to a child disabled with Down syndrome," Provenzo writes. "Given that Palin's decision is being celebrated in some quarters, it is crucial to reaffirm the morality of aborting a fetus diagnosed with Down syndrome (or by extension, any unborn fetus)—a freedom that anti-abortion advocates seek to deny,"
Reaffirm the morality? Killing a baby is never moral. You can't just make up your own morals. First babies, then confused senior citizens - what's next, anyone who inconveniences you? We wouldn't want you to be inconvenienced now, would we? Palin's decision is being celebrated because so few seem to have any morals anymore. A Republican sees a homeless man on the street and reaches into his pocket to give him some money. But Can You Keep them Locked Up? What's the point if they're out in a few days? Recent pictures from North Korea. *If there is a God, I want to know what he has to say. *If there is no God, then nothing anyone says or does will matter. *What the Bible says and what people say it says are two different things. Read it for yourself and learn the difference. *The Bible has all the basic principles of a successful life. *We are all free moral agents. Therefore I cannot impose my religion on others. *The Bible is the foundation of all knowledge, but it is not all knowledge. Read widely. Learn from those smarter than you. *Your god is what you think about most of the time. *We have two major political parties in this country: the Pharisees and the Sadducees. Ron Dart at Looking for Truthtellers stumbled on some anti-humanism websites and posted his thoughts on them. Personally, I find them very disturbing (the websites, not his thoughts). There are some places I wish the human mind couldn't go. ...start thinking seriously about killing all those but our most valuable members of society. Where have we heard this before? Nothing new here, except maybe the reason they give - saving the planet. Democrats on Capitol Hill who support Obama say no. He didn’t even show up to vote for it. A Pennsylvania cat lover got a smelly surpise (sic) this week when a neighbor's cat turned out to be a frightened skunk. Not only did the skunk spray the woman, but it ran into her Mount Carmel home. It took about several hours for emergency services officials to get the putrid pest out of the house. Lions and Tigers - No Bears, Oh my! "Turns out there's a tiger, and I understand he's hungry ... so we're staying away from him." Survive a hurricane, get eaten by a tiger - just the luck. Are you sure the owner is still there? Check out the picture at that link, it makes me think of a little kid on a bike with training wheels trying to be like the big kids. Awesome pictures of the hurricane Ike aftermath. Some of it anyway. "The right to preemptive attack of a country that was planning an attack on America?" Isn't that just common sense? What country in history has thought it did not have the right to attack those planning to attack it? I learned the "Bush Doctrine" when I was a student at yeshiva in the fourth grade, when I was taught a famous Talmudic dictum from about 1,800 years ago: "If someone is coming to kill you, rise early and kill him." "The Obama campaign issued an angry denial to a report yesterday that the Democratic presidential candidate privately urged Iraqi leaders to delay U.S. troop withdrawals, but the statement essentially confirmed the story." "But in the same statement, Morigi said Obama had told the Iraqis they should not rush through a 'Strategic Framework Agreement' governing the future of U.S. troops until after President Bush leaves office,"
A government official in Saudi Arabia cut out his daughter's tongue and burned her to death after learning she had become a follower of Jesus Christ. The letter signed L. David Alinsky closed by saying, "I am proud to see that my father's model for organizing is being applied successfully. ... It is a fine tribute to Saul Alinsky as we approach his 100th birthday." Alinsky founded and trained community organizations to follow his methods, including organizations in South Chicago, where Barack Obama credits his political beginnings. As the Washington Post reported last year, Obama was hired shortly after graduating from college by a group of Alinsky's disciples to be community organizer. ...stirring mass organizations of "Have-nots" that would rise up and seize power from the "Haves." You mean like Zimbabwe? Yeah, that works - NOT. Regarding the Lucifer dedication, He already had his own kingdom, he wanted more. He lost everything, his fate is sealed. Don't let him fool you. More than he wanted to be remembered for having been president, Mr. Jefferson wanted to be remembered as the author of the Virginia "Bill for Establishing Religious Freedom." In the text of the bill he underlined this sentence: "The opinions of men are not the object of civil government, nor under its jurisdiction." In a republic of free citizens, every opinion, every prejudice, every aspiration, every moral argument has access to the public square in which we deliberate the ordering of our life together. "The opinions of men are not the object of civil government, nor under its jurisdiction." And yet civil government is ordered by, and derives its legitimacy from, the opinions of the citizenry. Precisely here do we discover the novelty of the American experiment, the unique contribution of what the Founders called this novus ordo seclorum, a new order for the ages. Never before in human history had any government denied itself jurisdiction, whether limited or total, over that on which it entirely depends, the opinion of its people. For more than a week we've seen the No. 1 person on the Democratic ticket argue that he's better prepared than the No. 2 person on the Republican ticket. That's not a winning argument even if you win it. A very interesting column. Perhaps McCain is not so "out of touch" after all. Christianity is not incompatible with a republican form of government. It is the foundation of republican government. Our Founders recognized this. John Jay, President of the Continental Congress and America's first Chief Justice of the Supreme Court, declared, "No human society has ever been able to maintain both order and freedom, both cohesiveness and liberty apart from the moral precepts of the Christian Religion applied and accepted by all the classes. Should our Republic ere forget this fundamental precept of governance, men are certain to shed their responsibilities for licentiousness and this great experiment will then surely be doomed." Jay, who co-wrote The Federalist Papers with Alexander Hamilton and James Madison, knew whereof he spoke. It seems to me that responsibility has already been shed and licentiousness rules the day. The founders of this United States of America had more wisdom in their little fingers than everyone in the whole government today. We are groping in the dark blindly and think we have vision and intellect beyond any nation that has ever existed. In my mind that makes us fools. 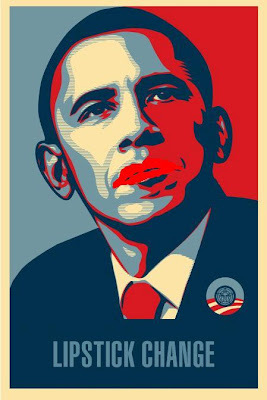 Y'know, if I were Barack I wouldn't be accusing anyone or any party of lipsticking because Obama is the king of the crimson paste. This man, his record, his associations, and his plans to screw . . . I mean change . . . America has more makeup than Michael Jackson, Gloria Swanson, Jezebel, Ryan Seacrest and the demented bag lady I saw at a bus stop the other day in downtown Miami combined. Matter of fact, I believe Revlon is one of the chief sponsors of Obama's Audacity of Hype tour. 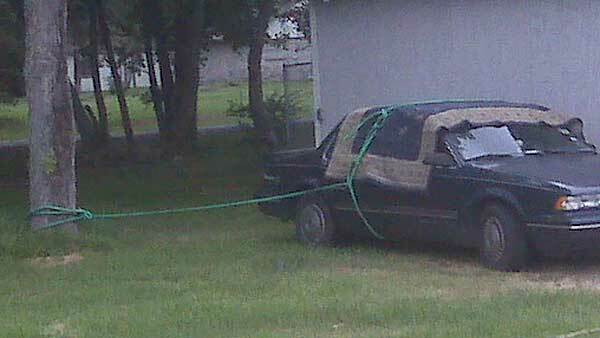 How to protect your car in a hurricane. Is Sarah Palin drugging liberals? A Canadian man is recovering in the hospital after a black bear swam across a river, climbed onto a dock and then jumped on a boat and attacked him. And a lot of hard choices. Can American socialism ever be reversed? Even as others such as The Heritage Foundation label it "unfortunate but necessary," the Kentucky Republican is incensed by the proposed federal bailout of Fannie Mae and Freddie Mac. To shore up the shaky mortgage giants, the plan would put taxpayers on the hook for as much as $5 trillion. As the head of the Congressional Budget Office announced, the mortgage giants are now part of the federal government. As Bunning commented back in July when Paulson announced his plan, "When I picked up my newspaper yesterday, I thought I woke up in France. But no, it turned out it was socialism here in the United States." 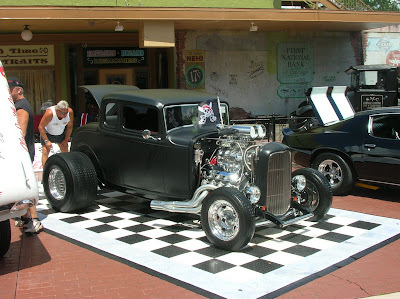 If you elect Obama it won't be creeping socialism anymore, it will be flat out sprinting. "Anyone that tries to come into someone's home like that, you deserve the consequences,"
I like this picture of the Twin Towers, pre-9/11. You're rattled. And it shows. "We are here to talk about education, but, you know, I'm running for president, so that means I've got to spend a just a brief moment talking a little bit about politics," Obama said apologetically to a roomful of teachers, parents, and school board officials. "Before we begin today, I want to say a few words about the latest, made up controversy by the John McCain campaign," he continued as the crowd chuckled. But there is nothing "phony" about it. There was a spontaneous groundswell of people who were genuinely offended by the comment. He may not have meant to call Sarah Palin a pig but it sure sounded that way and instead of being an insensitive jerk he should have just apologized. I stopped at Publix on my way home this morning and people were talking about it and fuming. This didn't come from McCain, he only took advantage of a situation Obama put himself in. Obama is an insensitive jerk and it looks like he'll be self-destructing soon. We can only hope for that change. For the sensitivity-impaired among us: This remark is not offensive just because Sarah is a woman. When McCain used the line to describe Hillary's health care plan, it was obvious he was describing the plan not Hillary. Sarah Palin had just given a speech in which she described herself as a pitbull with lipstick and right on the heels of that Obama uses the lipstick line. Most likely he just spoke without thinking - it seems to be his modus operandi lately - but the connection is fresh in peoples minds and he should have stepped up and apologized instead of whining about it - also part of his M.O., by the way. I'm 426 miles away from the center of hurricane Ike - according to Stormpulse - and there is a good, stiff, if not strong, wind blowing. We even had some squalls come through last night. That's a big storm. This is to miss something of the greatest importance: that in the world of Barack Obama, community organisers are a key strategy in a different game altogether; and the name of that game is revolutionary Marxism. Community organisers would mobilise direct action by the oppressed masses against their capitalist oppressors. "just calling the same thing something different." The same world that wants to see a weaker America. Let him head the United Nations. C-Ya! Very cool. The storm archive is impressive, too. Do You Take This Man to Be Your Lawful, Wedded Party A? "Brides" and "grooms" are no longer allowed to marry in the State of California. Barack Obama ripped into John McCain and Sarah Palin as never before Monday, accusing his Republican White House foes of "shameless" dishonesty with their claim to be "mavericks" ready to shake up Washington. I doubt very much that McCain/Palin will shake up Washington, but then neither will Obama and if you believe he will I have a bridge to sell you. At least both McCain and Palin have a history of going against their party, Obama doesn't. Obama doesn't so much want to shake up Washington as he wants to grow it. Obama wants to feed the gremlin after midnight. If there is one thing America doesn't need, it's a larger, more powerful government. A burglar who broke into a home just east of Fresno rubbed spices over the body of one of two men as they slept in their rooms and then used an 8-inch sausage to whack the other man on the face and head before running out of the house, Fresno County sheriff's deputies said Saturday. Say Lt. Ian Burrimond, "I tell you, this was one weird case." Nothing about Obama is as it seems on the surface, he has phony written all over him - completely leaving religion out of it - he's not what he wants you to think he is. Perhaps he was trying to be sarcastic when saying "my Muslim faith," although he didn't sound like he was, most people put emphasis on the sarcasm. He talked right through it as though it were a very comfortable thing for him to say. Be that as it may, he handled the question wrong, as he so often does when he is not scripted. Sarah Palin is the anti-Obama: not a victim, not a poser, not riding a wave but rather swimming upstream — and most of all, not having run for president her entire life. Sarah Palin has stolen Barack Obama’s glamour. She’s stolen his excitement, robbed his electricity, burgled his charisma, purloined his star power, and taken his Hope and Change mantra, woven it into a cold-weather fashion accessory, and wrapped it around her neck. This mother of five has put the entire journalism industry on timeout. Is Joe Biden really all there? I am hardly a Bush apologist. I believe emphatically the Bush administration has violated the Constitution time and time again. But so has Biden. So has nearly every member of Congress. If we're going to start prosecuting for that offense, we're going to need internment camps near Washington, D.C., for the show trials. Until that time comes, it's probably best to appeal to the American people to reclaim their Constitution and make them the enforcers. We've drifted so far from our constitutional heritage that neither party really recognizes the strict limits our founders placed on the actions and powers of the federal government. No one wants to see the Constitution respected and revered and upheld and obeyed in Washington more than I. But Joe Biden and Barack Obama are proponents of a "living Constitution" that changes to suit their own crazy ideas. Do you know what a "living Constitution" really is? It's a dead Constitution. It's one that means anything you want it to mean – which is to say it means nothing at all. Do we really want to put the power to prosecute political enemies in the hands of people like that? For conscience and the Republic, we must declare ourselves independent of a party system that places good people under the yoke of iniquity. This photo captures a disturbing trend that is beginning to affect wildlife in the US. In full-color photos. Click on object list to get to the picture link page. It's always interesting to see old photographs, and these from Russia - how cool is that? is from the Democrats teeth. They've only just begun to hate this woman. Did you see this speech? "out of the need to preserve the notion that no one, no attorney general, no president -- no one is above the law." I'd love to see that principle carried out honestly in the congress and senate. Hypocrites, all of them. Google released their new browser yesterday, it's called Chrome. I tried it out yesterday and found it interesting, but not outstanding. I like FireFox much better, especially security-wise. I do like that Chrome shows thumbnails of your most visited sites when you open a new tab. It would be better if you could choose between most visited sites and sites of your choosing. Opera does the latter. It imported my FireFox bookmarks exactly as they are in FireFox, instead of putting them in a separate folder like Opera did. Just a few minutes ago I loaded a few forums I use and it automatically filled in the user name and password. Sounds good except I never visited those sites with Chrome before so how did it know the passwords? I just visited another one and it did the same. That's a little disconcerting. Did it get the passwords from FireFox? It also tried getting access to the internet a few times even after I had closed it, presumably looking for updates. I don't know. I won't be using Chrome very often, if at all. It's a curiosity. I use FireFox and I use NoScript, and I love it. Chrome creeps me out privacy-wise. Edit 9/07: Chrome does copy passwords from FireFox, it says so when you are installing it. A Pakistani lawmaker defended a decision by northwestern tribesmen to bury five women alive because they wanted to choose their own husbands, telling stunned members of Parliament to spare him their outrage. The problem with tradition is that it often becomes a crutch for the unthinking. I know they are basically harmless but they look like they're going to jump on your neck and rip your head off. And they are fast. The other day I was putting stuff in the car to go to work, lifted the tailgate, and there it was on the window above my head. I grabbed a towel I had there and pushed it out - I thought. I couldn't see it anymore because it was dark. James was getting in the passenger seat and started yelling about a spider. I looked over and saw it on the window behind the rear seat. I grabbed it with the towel, made sure I got it and flung it into the darkness. Hopefully dead. Let them live somewhere else. Last night I was driving with James again - in the dark - and he started screaming about a bug. It must have crawled on his hand. After I recovered from a near wreck he said he couldn't find it and we kept on. He had put the light on though and finally saw it so I stopped and killed it. It was a spider, not a wolf spider, but about a inch long brown spider. I only like spiders when they stay outside, if they enter my house or car, all bets are off. They are not staying and they probably won't survive my getting them out. Click here and scroll down to check out pictures of wolf spiders. Not what you would normally think. This is a cool video. I actually did already know this but only because I recently read about it somewhere on the web.